Politicians, citizens, and police agencies have long embraced community policing, hoping to reduce crime and disorder by strengthening the ties between urban residents and the officers entrusted with their protection. That strategy seems to make sense, but in Citizens, Cops, and Power, Steve Herbert reveals the reasons why it rarely, if ever, works. Drawing on data he collected in diverse Seattle neighborhoods from interviews with residents, observation of police officers, and attendance at community-police meetings, Herbert identifies the many obstacles that make effective collaboration between city dwellers and the police so unlikely to succeed. At the same time, he shows that residents’ pragmatic ideas about the role of community differ dramatically from those held by social theorists. Surprising and provocative, Citizens, Cops, and Power provides a critical perspective not only on the future of community policing, but on the nature of state-society relations as well. 3. Elusive Legitimacy: Subservient, Separate, or Generative? "’ It is a mistake to believe that community can bear the political weight that projects like community policing place upon it’ . . . . It is this thesis that makes the book both theoretically interesting and useful, particularly for those intrested in issues of community governance and locally based crime control initiatives. Overall, this book represents a fresh and radical departure." "This is a fine book. It is accessible and very well written. . . . I appreciated the way Herbert again pried open the black box of the state, offering us a careful and not unsympathetic reading of police culture. Although written for a wider audience, geographers interested in law and policing, political theory, and the enduring romance of community will find it worthwhile." "This book is well written and well organized. . . . The book’s conclusion provides sobering evidence for the limitations of the community policing approach." 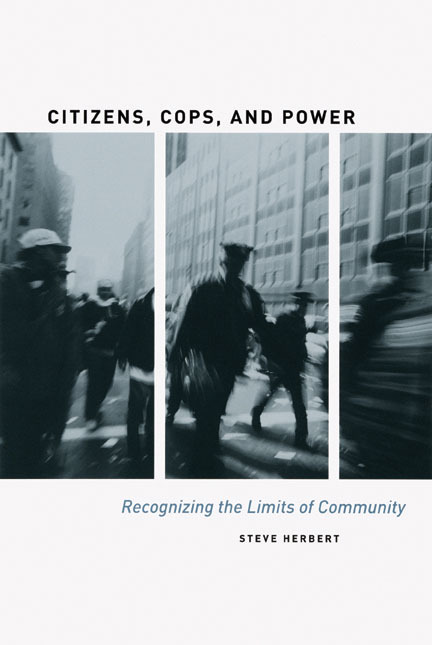 "Herbert’s book is a political sociological analysis of the potential of deliberative democratic action at the local level. . . . [It] will remain the standard for studies of community policing for years to come."